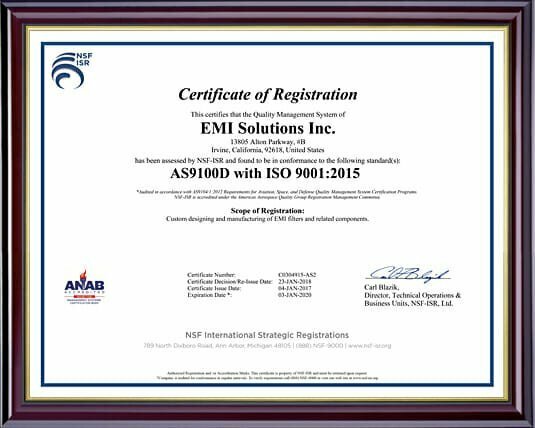 EMI Gets AS9100D and ISO9001:2015 Certification | EMI Solutions Inc.
EMI Solutions Inc. has successfully achieved the AS9100D / ISO9001:2015 registration for its Irvine, California manufacturing facility. A leading, woman owned manufacturer of EMI filtering products, including its industry leading FlexFilter inserts, the company continues to meet and exceed customer expectations to perform to the Quality Management System standard for companies supplying to commercial aviation, aerospace and defense organizations. AS9100 is an internationally recognized aerospace industry standard for quality assurance in design, development, production and service. AS9100 standardizes, to the maximum extent possible, the quality system requirements of the defense, military and aerospace industry.